An ailing economy has forced users of conveyor belting to find ways in which to extend the life of the belt. This can be achieved, but only if the conveyor system is well maintained and operated within original design parameters. In the recent past, a significantly aged belt was replaced by a new belt, thus virtually eliminating the risk of failure. Now, however, taking into account the cost of belting and the lack of capital in many companies, every last bit of life is squeezed out of a belt. Due to these factors it has become quite a common practice to replace only severely damaged portions of belt. The example in this paper considers new belting supplied for a particular overland conveyor and installed 11 years ago. Recent external damage called for a length of belting to be replaced, and the splices related to the new piece of belting failed in quick succession. This occurred despite tough quality assurance measures being applied. The task of splicing the belt was transferred to a second reputable splicing company, yet similar results were produced. Advances in rubber compound development over the last 15 years. Rubber deteriorates over time, so that even if an identical compound to that used in the original is applied, the original may have matured to the point of no longer being compatible with a fresh batch of compound. Identification by the splicing company of the compound, and management of the process to ensure that some incompatible, cheap, imported compound is not used to splice a belt, potentially risking production hours and safety. Modern advances in conveyor belt splicing. Conveyor belt splice management guidelines. In order to understand the compounding of rubber, ingredients of the rubber compound must be known. Polymer: 100 pph . Natural or synthetic. Filler: 30—60 pph. Most common is carbon black. Antioxidants: 1—3 pph. Helps protect the compound from high temperatures while in use and during mixing. Antiozanants: 1—3 pph. Protection against ozone attack. Oil: 5—30 pph. Assists in the incorporation of all dry components during the mixing process. Changes mechanical properties of final product (hardness). Curatives: 5—10 pph. Most common is sulphur. Creates crosslinks between rubber molecules with the addition of heat. In response to the ever increasing demand for natural rubber, it has become crucial to explore other avenues of supply. Natural rubber is a limited resource and in the near future the demand will outstrip the availability. 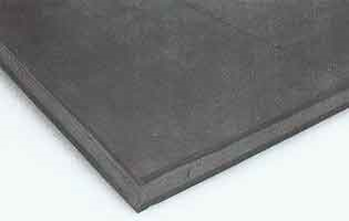 Rubber compounders are constantly attempting to improve the properties of rubber compounds. It is for instance, now possible to replicate the same properties of natural rubber using synthetic rubber. By the use of certain additives and fillers, the mechanical and chemical properties of rubber can be changed. Aramid fibers for instance, change the indentation rolling resistance of the compound. It is, however, a matter of give and take. With the addition of one compound to improve a particular property, it might very well change another property for the worse, such as elongation or tear resistance. Constant research has made possible a fire retardant compound with low abrasion loss characteristics, in the region of 130 mm3. The determination of abrasion loss is described in SANS 4649/ISO 4696, Rubber, vulcanized or thermoplastic – Determination of abrasion resistance using a rotating cylindrical drum device. Test Method B – Rotating test piece. Fifteen or even five years ago such low values were totally unheard of. The continuing re-development of compounds could be the very reason for the failures or incompatibility of modern compounds with compounds used in the manufacture of conveyor belting 10 to 15 years ago. Some additives in a compound can be changed, or totally different additives used. The end result is a compound with the same properties as the original compound of 15 years ago without the two compounds being at all compatible. Changes occur within the compound during the aging process, significantly changing the structure of the compound. Therefore, even the same compound containing exactly the same additives will not be compatible and will result in a failed splice. Deterioration of rubber over time, meaning that even if a compound identical to the original is used, the original may have matured to the point of no longer being compatible with a fresh batch of compound. Polymer degradation is the change in the properties of a polymer: tensile strength, colour, wear resistance etc. This could result in various factors affecting the polymer or compound. Heat, light and chemicals may affect changes, and typically such changes are undesirable. Most polymers are susceptible to this type of degradation which is visible as discolouration or cracks in the compound. Thermal degradation can be defined as a compound’s loss of mechanical properties as a consequence of exposure to heat. The links between the polymer chains are broken and begin to react with one another, thereby changing the properties of the polymer or compound. Thermal breakdown could result in the generation of a variety of hazardous products such as carbon monoxide, ammonia and hydrogen cyanide, some of which may be toxic or flammable. The specific materials are dependent on the compound mix, additives used, specific temperature of exposure, time of exposure and environmental factors. Ozone in the air attacks double bonds in rubber chains, natural rubber, poly-butadiene, acrylonitrile butadiene rubber (NBR) and styrene butadiene rubber being most sensitive to this attack. Ozone cracks are likely to form in products under tension, however, the critical strain is very small. The cracks always occur at right angles to the strain angles. Through the modification of the rubber compound with the addition of anti-ozonants before the vulcanisation process, cracks could be retarded or even prevented. This is normally a type of wax that is formed and can be seen as a waxy substance on the covers of the belt owing to the blooming of the wax. It is possible for a polymer to degrade due to galvanic action. This is when two dissimilar metals in close proximity immersed in salt water cause one of the metals to corrode. In 1990 it was found that carbon fibre reinforced polymer (CFRP) can corrode under the correct conditions. This was described as the ‘Faudree Effect’. It is perhaps the reason for the breakdown in the bond between the bonder layer and covers of certain steel cord belts, as the two compounds contain carbon and other metals with different characteristics. This matter will be the topic of future research. One of the most important factors in achieving a successful splice is the selection of a reputable splicing company and the management of this company. Is the company a reputable company with traceable references? Is the company affiliated to a belting or compound manufacturer? Does the company manufacture their own splicing materials? Do they have access to testing facilities in order to perform compatibility testing and splice analasis? Is the company involved in material R&D such as materials and processes? 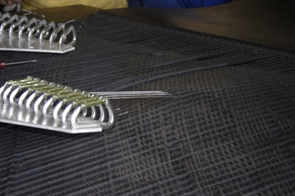 Does the company have a quality procedure in place to ensure traceability of splicing materials as specified by SANS? Do they have recognised, auditable procedures and processes? Are their tools and equipment in good condition? Do they have a skilled, trained, workforce? To ensure that the most reliable and safe splices are performed, the selected splicing partner must be managed. Even if the selected company complies to most or all of the selection criteria, some form of management is required. The issues listed below are important and should be seen as the minimum management input from the principle company. This is specially important in the replacement and installation of production-critical belts. Most of the criteria for the required documentation to manage the splicing company efficiently is contained in the relevant splicing specifications. Insist on adherance to a specific splicing procedure, either the hiring company procedure or any of the recognised international procedures such as SANS, DIN etc. A quality control plan (QCP) should be submitted and signed off by the partner company before commencement of splicing. Witness and hold points should be agreed upon up front. Compatibility of suggested materials with the principle’s belt must be proven before commencement of splicing. Recent test results must be available, not older than 12 months. These results should indicate the compatibility of the splicing company’s selected splicing material and the principle’s installed conveyor belts, irrespective of manufacturer. Ideally, these test results should show compatibility to all major belting manufacturers’ products. Request that a test splice be performed on site and analysed before any critical splicing takes place. There may be a cost involved in this, but it is well worth managing this potential risk. Request regular audits of splicing on site. The principle should be present at this stage to verify that all procedures are followed. Any other documentation as requested by the principle, such as safety information etc. Qualifications of personnel performing the splice. During the last decade, significant advances have been made in the field of splicing that have resulted in more reliable, cost effective splices with the shortest possible downtime. The introduction of specialised tools makes possible a reduction in the preparation time, while increasing the accuracy and quality of splices. Figure 2. Piano wire steel cord stripper. Figure 3. Knife steel cord stripper components. Figure 4. Knife steel cord stripper. Splicing material development is in a state of continuous development, searching for the ideal splicing material compatible with most compounds, and which will still achieve the required splice efficiency. Compound delivery for steel cord reinforced belt splicing has seen a change with the introduction of preformed and composite splicing compounds. Preformed compound does away with the need for bonder rubber noodles or strips inserted between the cables of a steel cord splice. With the correct preformed bonder rubber, the cords can be laid in the correct position more accurately and faster. Figure 5. 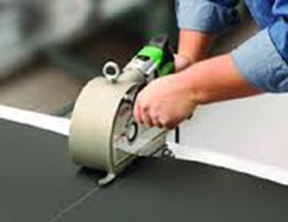 Preformed splicing material. 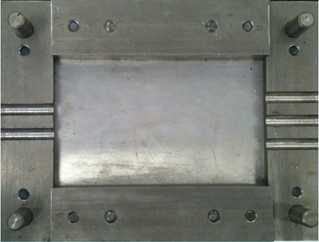 Composite splicing compound is assembled in the factory, similar to belt production. 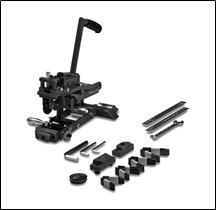 The bonder compound and the top or bottom cover compound is combined to splice specification and delivered to site in kit form. This eliminates the possibility of dust and other contaminant ingress between covers and bonder compound during assembly on site or in the workshop. Figure 6. Composite steel cord splicing material showing cover and bonder composite. To ensure the safe and efficient operation of any installation, a splice management program should be established. This can be done in conjunction with the splicing company or an external service provider with the relevant expertise. Splice monitoring is not an exact science and it is possible for splices to fail at any time without any prior signs of deterioration. All splices should be numbered in accordance with the relevant standards in order to better keep track of splice age and life. Splice measurement should be done at intervals mutually agreed upon. Visual inspection and measurement of splices should be recorded and analysed for any abnormalities. Permanently embossed marks shall be placed on the inside four corners of the splice on the bottom cover (see figure below). ∑4 dim to remain within 1 % of original value. Figure 7. Splice measurement matrix as per SANS. The sum of the dimensions shall not change by more than 1 %. The base line initial measurements shall be made on the low tension return side of the conveyor when the belt is under tension at a recorded datum point and always re-measured at the same datum point and under the same tensioning conditions. Initial measurement to be done by splicing constructor. Should the tensioning conditions change, a new set of base line dimensions shall be established. In the event of steel cord reinforced belting being used, a baseline scan should be done upon completion of splices to verify correct layout of cords and splice integrity. This can be done using either X-ray or magnetic flux leakage scanning. Regular follow-up scans should then be performed at agreed intervals. The follow-up scans must then be compared to the baseline scan, checking for any changes or deviations from the original. scan to determine the condition of all the cords within the belt. Figure 8. Typical representation of a splice on a steel cord reinforced belt, by means of magnetic flux leakage scan. 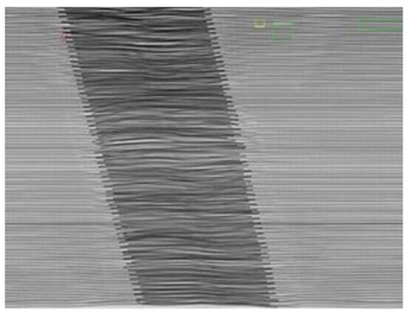 In the magnetic flux leakage scan image, the cords are magnetized and any leakage in the magnetic flux is detected by sensors mounted in a sensor array. The image in Figure 8 is of a two-stage splice showing no deformation in the splice alignment or stray and damaged cords in the splice area. Figure 9. Typical representation of a splice on a steel cord reinforced belt, by means of a X-ray scan. Further research is required on the effect of positive and negative bending of splices, different types of splices, including the effect of the frequency of bends on a splice, for instance at the head and snub pulley, or from a high tension snub pulley into a drive pulley. The specifying of a minimum relaxation distance between two bends in opposite directions should be investigated and documented. Figure 10. Conveyor system indicating positive and negative bends in short succession at pulleys A-C and at A-A. Figure 11. Din dynamic splice testing equipment. Compatibility of splicing material and belt is assessed by testing the adhesion of the splicing material to the aged belt cords. For this purpose the preparation of an H-block test piece is required. The H-block consists of three cords vulcanised in a splicing material rubber matrix. A minimum of four H-blocks are required for testing. Consider the leading belt as A and the trailing belt as B. Cords must be stripped in accordance with procedure for the preparation of a splice. Two H-blocks are constructed by using cords from belt A either side of a cord from belt B. (A,B,A,B,A) and two H-blocks constructed by using cords from belt B on either side of cord from belt A (B,A,B,A,B). Figure 13. Splicing compound in mould. After curing, the H-blocks should be left overnight to stabilise. Standard pull-out testing is then performed. A minimum pull-out figure would be 12 x cord diameter. Anything less, and a splice design may not have a sufficient safety factor if designed on 8 x cord diameter, normal. A result of less than 10 x cord diameter pull-out (expressed in kN/m) means rejection of the splicing compound. When the H-blocks have been tested, the mode of failure is noted, i.e. bonder to bonder, or cover to bonder. Cover to bonder is preferable as a greater proportion of splice strength relies on bonder to bonder adhesion. In addition, two H-blocks (one A,B,A and one B,A,B), must be subjected to dynamic cyclic testing to determine the compound’s resistance to fatigue. The set points would be 36% and 3.6% of the actual achieved pull-out test results. Some mining companies insist on 7 000 cycles minimum, with no evidence of cord pull-out. 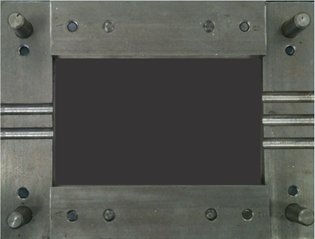 The cyclic blocks are again tested in the tensile test apparatus to determine any fall- off compared to the original lab-built H-block pull-outs. The figures should be about 95% minimum. Anything less must be rejected. 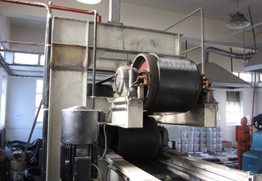 The same type of testing is applied to plied belts, using whichever compound is applicable. A lab pad is constructed containing all plies, and subjected to adhesion tests after allowing stabilisation. Results must be at least equal to new belt adhesion test results. 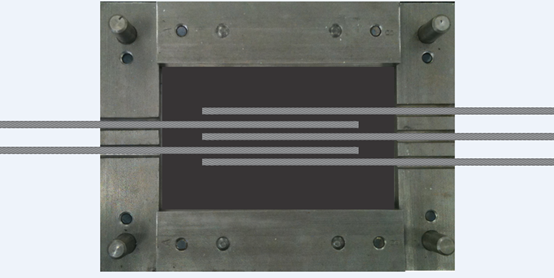 Extrapolation should result in a figure of approximately 65% of full belt strength when testing a four-ply belt if a reduced stepped splice is built. Rubber, as do humans, ages. How this aging process is managed may not be an easy and straightforward task. To ensure the safe and efficient operation of any spliced conveyor belt, it is important to ensure that the best possible materials and the best matched materials to perform the tasks are used, in conjunction with good practices, correct and functioning equipment, and operation by qualified and competent personnel. If the splice process is well managed, especially on steel cord reinforced belting, it should be possible to expect such a splice to last the life of the belt. If splices are regularly monitored for deterioration, early detection of any kind of damage can be managed, and possible losses due to a splice failure minimised by performing preventative maintenance. André is Head of Department – OE and Projects and one of the Service excellence Pillars for Dunlop Industrial Products and Rema Tip Top South Africa. Involved in the mining industry since 1986. Moving on to industrial and automotive bearings and quality management. Involved in bulk materials handling industry for last 10 years. Performing belt and plant audits. Splice failure analysis. Belt failure analysis. Belt selection calculations. Plant optimization and implementation of service and maintenance agreements.